The chart of accounts is a complete list of financial account codes (or nominal codes) into which financial transactions are posted and from which financial reports are produced. Brightpearl provides a standard chart of accounts or it can be rebuilt to meet your accounting needs. Find the chart of accounts at Accounting > Chart of accounts. Every account, or nominal, is assigned an account type. The account type controls how the account is treated when posting transactions and generating financial reports. When adding a code it will need to be added into a system defined number range, but this can be changed afterwards to use any 4 digit number. In the UK the number defines the account type. Brightpearl provides a standard chart of accounts which will allow you to begin using the platform straight away. If additional accounts are needed these can be manually added at any time. Those accounts which are not wanted can be deleted. Once an account or nominal has been used (accounting entries have been posted to it) it can no longer be removed from the system. When transferring historical accounting information from another system, your implementation consultant will import your chart of accounts and opening balances. When adding new accounts it is important that they are assigned the relevant account type so that financial information is reported correctly. 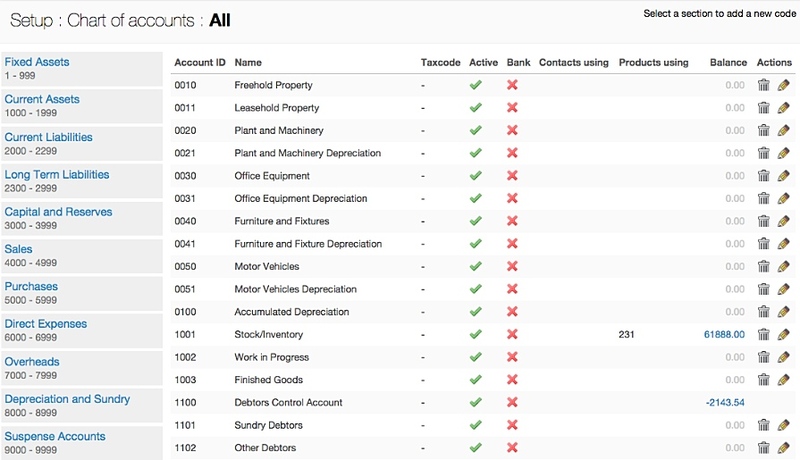 From the left-hand menu, select the account type you are adding, e.g. asset, liability etc. In the UK chart of accounts, the account type is denoted by the number range in which the account sits. In the US chart of accounts, the account type is denoted by the number range in which the account sits, however, it can be manually changed after the account is saved. Click the Add a new nominal code button. Nominal code name: The name identifies what this account is used for. It will be displayed throughout Brightpearl where ever you see nominal code fields. 4 digit code: Every account requires a code. Brightpearl forces specific number ranges to be used for each account type. In the US, you are able to edit the code later to sit outside of the number ranges if you wish. These codes can be hidden in Brightpearl if you want to use a custom code in the name instead. Tax class: This is the tax rate which you expect entries into this account to have. If an entry uses a different tax rate it will display on the VAT Exceptions Report. This rate is also used for recording tax on expense claims. Is this a bank account? : If this is a bank account it will display on the Bank Accounts List where you can view a balance, move money, view reports and manage reconciliations. Reconcile this account? : If this nominal code is a bank account you will probably want to reconcile the transactions that exist in Brightpearl with your actual bank statement to ensure they balance. Select Yes to activate the reconciliation process for this account. Show on expenses screen? : Select Yes to add this nominal code to the Expense Claim screen. 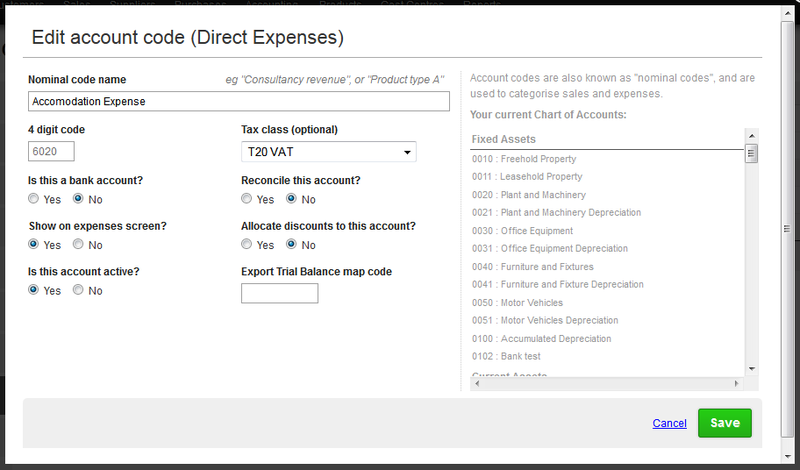 To record tax on expense claims ensure you also select a tax class. Allocate discounts to this account? : This will add the nominal code to the Payment Allocation screen to allow you to enter adjustments. For example, a customer under pays slightly and you wish to write-off the remaining balance. Is this account active? : If you no longer want to use a nominal code you can make it inactive, this will remove it from nominal code field selections throughout Brightpearl. Codes that have been used for transactions cannot be deleted. Export Trial Balance map code: If you wish to view a trial balance using a different number structure than Brightpearl provides you can enter the reference here. When you export a trial balance you will see this code instead of the Brightpearl code. This is useful for accountants who work with IRIS. Go to Settings > Data/Import > Import accounts. Click Import Chart of Accounts. Browse for the file to import. Click the Upload Chart of Accounts (CSV) button. Brightpearl automatically posts accounting entries as actions are performed, such as invoicing, shipping and stock corrections. The accounts settings allow default accounts, or nominals, to be defined and used for these accounting entries. Set the default accounts at Settings > Company > Accounting: Accounts or Accounting: Nominals. New products will be assigned this account by default. It can be changed on the product manually or via an import. When invoicing sales orders the product sales account is used for recording the revenue or income - unless overridden by the customer or user directly on the sale. When shipping items on sales orders the product purchase account is used to record the cost of goods sold. When receiving goods-in on purchases the product inventory account is used to record the asset value. When allocating landed costs this code will be selected by default. A different code can be selected during the allocation process if required. When a shipping charge is added as a line item on a sales order it will be assigned this account. When invoicing the sales order shipping will be recognized in this code - unless overridden by the user directly on the sale. When a discount coupon is applied to a sale in EPOS it will be posted to this account. When a sale of a gift card is made it will usually be recorded as a liability. Set the gift card code here so that it can be selected on your goft card product as the "sale" code. This code will be used automatically for sales of gift cards made through Magento. This setting is no longer used. When adding inventory as a correction, either manually or via an import, it will increase the asset account assigned to the product. This account will be used for the opposing credit entry. When removing inventory as a correction, either manually or via an import, it will decrease the asset account assigned to the product. This account will be used for the opposing debit entry. When inventory is received on a sales credit it can be quarantined, put back into stock or written off. When the items are written off two journals are created - the first to add it back into stock and the second to remove it from stock. The second journal will use this account to record the value written of and removed from assets. When manually editing the asset value of inventory, it will adjust the purchase account assigned to the product. This account will be used for the opposing entry. When receiving inventory and invoices on purchases two transactions are posted. This code is used on both the inventory journal and the invoice journal as the balancing entry - once both actions have been performed the account is cleared of any balance. Brightpearl rounds values on sales and purchases so that the order total is always to two decimal places, as do other systems. However, there are many different ways of rounding and calculating these values and it is unlikely and any two systems use precisely the same rounding rules. Since Brightpearl integrates with many other systems there will be times where there are differences due to rounding. When an order is downloaded Brightpearl will ensure that everything matches even after rounding differences by making an adjustment on the order. The correction will always be posted to this account. This code will be used for deferred cost of goods sold accounting journals. Deferred COGS can be activated at Settings > Accounting: Options. Hiding accounts will mean that only the account name will be visible throughout Brightpearl. If you would rather use your own numbering system instead, you can enter a number directly into the account (nominal) code name.